The latest issue came up over the weekend when Magic Johnson said in Philadelphia that Ben Simmons had wanted to sit down with him and pick his brain as the best big guard ever to play in the league. 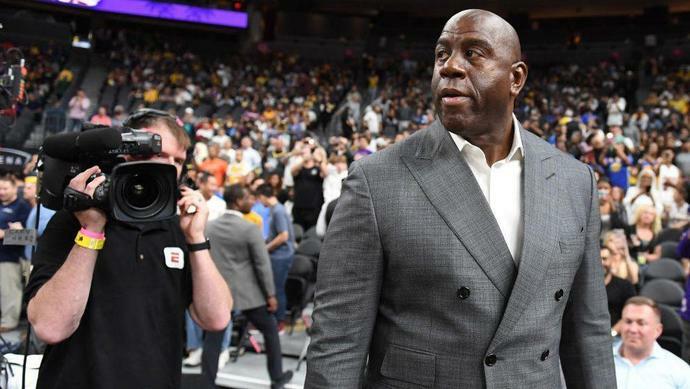 Simmons wants to meet with other Hall of Famers as well - Dr. J, Kobe Bryant - but Magic poses a special problem because he is the Lakers team president. Which brings up the tampering issue. First off, this appears to be an old, dead issue that came back to life only because Magic couldn't help himself from mentioning it. From telling Lonzo Ball the team expected to retire his jersey at a press conference days after he was drafted (the Lakers only retire the jerseys of Hall of Famers, so no pressure kid), to those three tampering fines, Magic just keeps saying or Tweeting things he shouldn't. Then there's the "who contacted whom first" question. Sixers GM Elton Brand said on the radio it was not the Sixers who reached out to the Lakers, so the question is who made the first contact. Was it Simmons' people? It doesn't sound like this warrants a tampering fine just on the surface of it, but the league is very sensitive about these things - unless, of course, it's two players talking then all bets are off - and any outcome is possible.